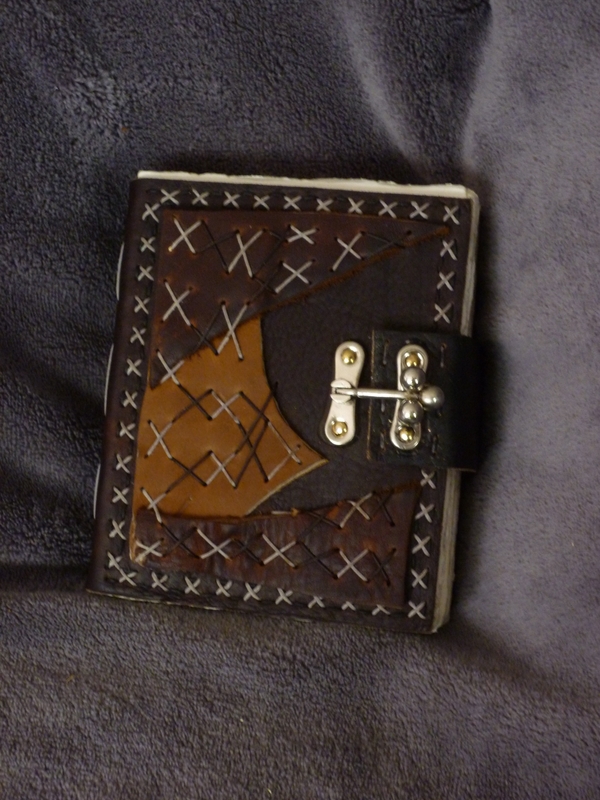 The next journal that I made is the Leather X’s Journal. With this one I wanted to explore fully covering the metal of the back and front cover using multiple types of leather (both in color and texture) and using the thread that binds the leather as a design element. I also made this one a smaller size, about 3″ X 5″. I found working with the smaller size a challenge. While I was working on it I had half of a quote to a book that I can’t really remember running through my head; basically the quote said that if you could create something in miniature then you would work out all of the issues in creating at a normal size. This has been sticking in my head for the last few journals, but I’ll post about them later. 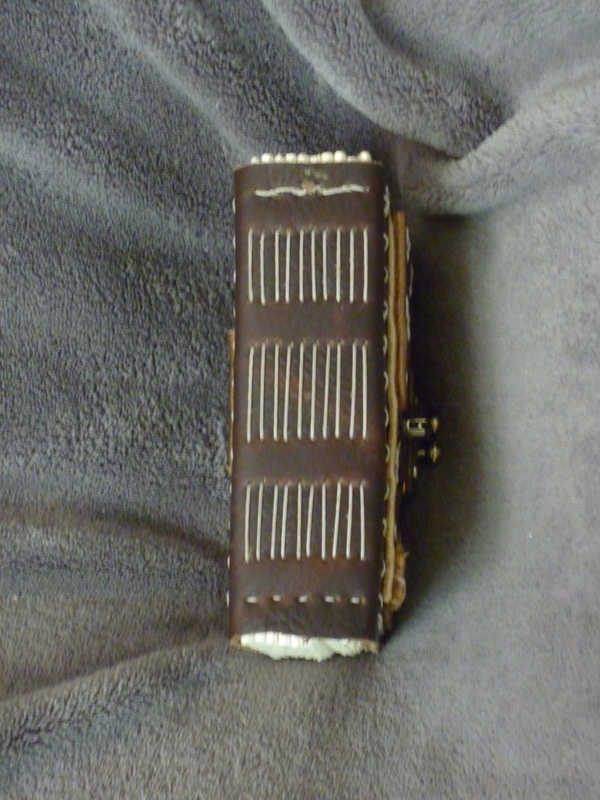 For the cover of the Leather X’s Journal I decided to use a dark brown leather for the base of the cover, spine and back. For the other pieces of leather I tried to grab some contrasting colors. To gain a sense of depth I placed the light tan leather under the midtone brown. With the shapes I tried to create a dynamic, flowing edge to them drawing your eye all over the journal but always bringing it back to the center. In attaching the base leather I went with making a lot of smaller x’s to give myself a larger space to work with for the design of the cover. While the base leather is attached with evenly spaced x’s, the mid- and foreground leather are attached with slightly irregular x’s. Additionally I used alternating colors of thread to add some more contrast to the cover as a whole. I chose the bright silver closure because as a whole the cover seemed too dark to me, with there being only a small amount of the tan leather showing. To rivet the closure on to the cover and strap I used some brass nails. To create a base for the closure to rivet to on the strap I sewed a small clipping of copper to the underside of the strap and riveted the other side of the closure through the leather to the copper underneath. All in all I’m fairly happy with the way the cover came together from my initial design ideas. As with the Metronome Lever Journal, I decided to keep a simple approach and just bound it and created a smash knot in the center of the top. At 10 signatures of 3 pages per signature, the Leather X’s Journal has a nice weighty feel to it without being too heavy. With the back of the Leather X’s I decided that simpler was better, and mirrored the stitching on the front cover for the dark brown leather. To attach the strap of the closure I chose to do two rows of x’s and maintain the minimalist approach that I took with the back. 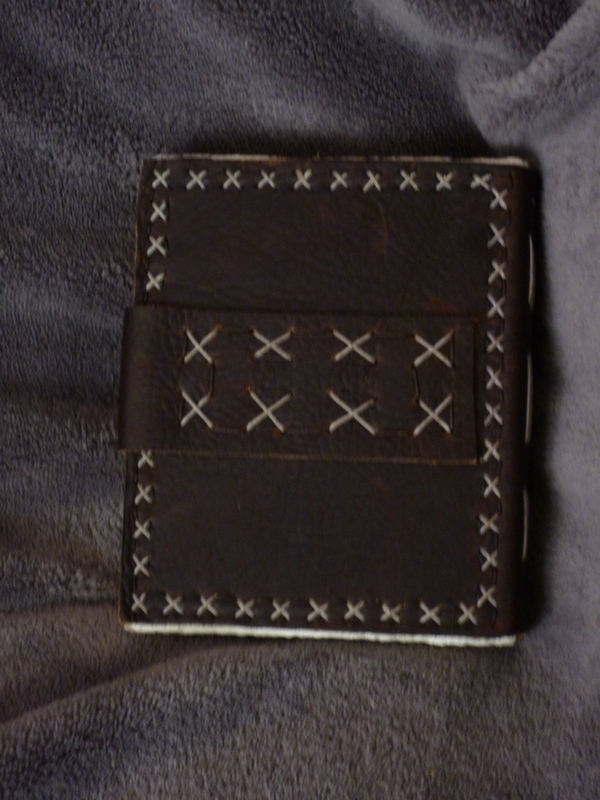 I’m very pleased with the way that the Leather X’s Journal came out. Both the size and the weight give it a good feel in your hands. I don’t know if it’s the way I bound it or if I simply did something different with the binding but the opening and closing of the book even has a nice feel to it. That’s it for the Leather X’s Journal. Next up is the Tri-Gear Journal. See you then. This entry was posted on August 1, 2010, 11:44 am and is filed under Art, Book-binding, Journal-making. You can follow any responses to this entry through RSS 2.0. You can leave a response, or trackback from your own site.